“Athletes of the Week” (AOW) are selected based on athletic performance and sportsmanship. Positive sporting behaviour is valued at KES and integral to our Athletic Philosophy and School Mission Statement emphasizing gentleness and learning and dignity and respect. Junior Boy ~ Piero Pizzuto Allende has been a great asset to the Junior Boy’s A Soccer team this season. He was a key component of the team’s midfield, where his sense of play and distribution of the ball created many offensive opportunities. As a midfielder, Piero was everywhere on the pitch and seamlessly changed between offensive to defensive tactics when the situation required it. He is a skilled player with a great sense of the game, who is always there to support his teammates when needed. Well done, Piero. Junior Girl ~ Maggie Mills brings tireless and aggressive play to all our soccer games, and as the core of the centre midfield, she makes it very difficult for the opposition to move the ball down the field. Her strength offensively when shooting the ball from any distance is second to none in our division. Maggie’s smart moves, her ability to persevere through difficult situations, and her overall athleticism were a big part of the team's success this season in the Tier 1 Division. Senior Girl ~ Aria MacDonald: We would not have won our first NSSAF cross country championship without each of the top 4 girls, but Aria MacDonald is the only runner who decided to run an extra kilometer by running up in the Senior Division. Aria sacrificed her own individual podium chances in the Intermediate Division in order to give the Senior girls a fighting chance to win a title - and that they did. Even though Aria is an intermediate runner, she still managed to place 9th out of 93 in the Senior Girls’ Division. Junior Boy ~ Jacob Fines Belcham: Our Junior Boys B Soccer Team ended the season with the Frozen Toe Challenge versus Armbrae Academy on our “HOME TURF”. The score was tied 9-9 after a two game aggregate, and the score was still tied after 5 dot-shots. Jacob was called upon to break the tie after an Armbrae miss. He went “top-shelf” with a goal and the team celebrated their win with POPSICLE Freezies. Thanks, Jacob, and congratulations to our team! Junior Girl ~ Abby McCarthy is one of our new hockey recruits, and although a junior student, she has wasted no time making her mark on our Girls’ Prep Hockey team! A kind and funny character off the ice, Abby is anything but on the ice! She is relentless on the fore-check, causing havoc for the other team, she works hard to get pucks to her teammates, and helps in the D-zone by blocking shots and clearing the zone. A highlight for Abby this month was scoring her first KES goal, and this weekend she continued her point streak with an assist on our only goal in the girls’ win vs Rothesay Netherwood School last Sunday! Keep up the great work, Abby! Senior Girl ~ Jenna Leighton has been a consistent force for our Hockey team this season and this weekend was no exception. Jenna is a strong defensive centre who is rarely out of position and back checks like no other! Her energy on the ice and hard work during her shifts gives our team the energy boost they need to have a good shift of their own. She communicates well with her line and has built great chemistry with new and returning teammates. This weekend Jenna scored our only goal in our 1-0 win vs Rothesay Netherwood School! Congrats Jenna! 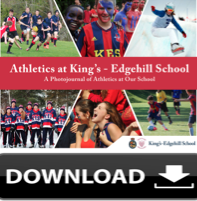 Athletics is one of the four pillars of a King's-Edgehill education which is why we offer three seasons of various sports and athletic options. Download our Athletics PhotoJournal to discover which of the over 20 different athletic options your child will love.